For a moment, I thought the Human Bomb was punching the guy in the thigh. My assumption was he was reaching to grasp something a bit more intimate than thigh, particularly given that he had to take his glove off first. 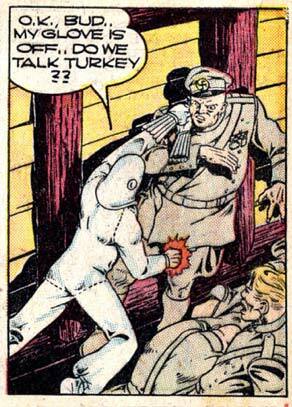 Interrogation techniques have sure changed since the 40’s. That seems so much better than Waterboarding.